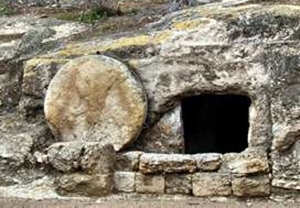 Does the tomb of Jesus really exist? Is there any archeological evidence that validates the biblical record? Jesus was crucified at the place call Golgotha (Matt 27:33; Mark 15:22; John 19:17), which in Aramaic means "Skull." Little is really known of what Golgotha described or represented, and archeologists are left with several questions. Did it describe the appearance of the hill? Did it represent a place of execution or suffering? Did it describe a place where bones were scattered? The gospels record the location of Golgotha as being outside the walls of Jerusalem (John 19:20) and near a well traveled road (Matt 27:39; Mark 15:29); but, the gospel accounts are silent as to whether Golgotha was a hill. After this, when it was already evening, a man named Joseph went to Pilate. He was a rich man from the Jewish city of Arimathea, a disciple of Jesus (though he kept it a secret for fear of the Jews), and was looking for the kingdom of God. He was a reputable member of the Sanhedrin, a good and just man who had not agreed with their decision and actions. Since it was Preparation, the day before the Sabbath, he boldly went to Pilate and asked for permission to take away the body of Jesus. Pilate was surprised to hear that He was dead so soon, so he called for the centurion asked whether Jesus had already died. On learning that it was so, he granted the body to Joseph. Joseph then bought fine linen cloth and went and took down the body. Nicodemus also came, the man who at the beginning came to Jesus at night, bringing a mixture of myrrh and aloes weighing about seventy-five pounds. They took away the body of Jesus and wrapped it in the clean linen cloths along with the spices, according to the Jewish burial custom. Near the place where He was crucified was a garden, and in it was an unused tomb that Joseph had newly carved out of the rock. Since this was Preparation Day and the Sabbath was imminent, they laid Jesus there because the tomb was so close. Then they rolled a large stone against the door of the tomb and left. The women who came with Jesus from Galilee had followed – Mary Magdalene and the other Mary, the mother of Jesus – and as they sat across from the tomb, they saw where and how His body was laid. They rested on the Sabbath day in observance of the commandment. The tomb was in a garden near the place of crucifixion (John 19:41). The tomb was cut out the rock (Matt 27:60). The tomb was a new tomb originally created for Joseph of Arimathea (Matt 27:60). The tomb had a large rolling stone that could cover the entrance (Matt 27:60; Mark 15:46; 16:4). The tomb was large enough for someone to sit down inside (Mark 16:5; John 20:12). The tomb required one to stoop down to look inside and enter (John 20:5-6, 11; Luke 24:12). Doorway: this rock cut entrance led into a small cave area. Niche: this was a hole in the rock that could accommodate a whole body. Rock bench: this was a rock shelf upon which a body could be prepared then placed into a niche or prepared and left there. Combined with dating of artifacts such as grave goods, pottery shards or organic material found in the tombs, stratigraphic location of the tombs, tomb architecture, and inscriptions, archeologists have found some distinctive features and burial practices that determine whether a tomb was constructed during the first or second temple period. First temple tombs were rock hewn burial caves with niches or wide rock-cut benches that were usually cut into the walls of the burial chamber. They sometimes included a raised headrest, After the body had decomposed, a space cut out beneath the benches served as long term repositories for bones so that the bench would be available for use again. The second temple period (515 B.C. – 70 A.D.) featured tombs that were similar to the first temple period; however, the Jewish tomb of the Herodian period (30 B.C – 70 A.D.) typically used stone chests with lids called ossuaries. In contrast to the first temple period, when the bones of the deceased were placed in a common repository, the second temple period placed the bones of the deceased into their own ossuary for a second burial if the deceased had a belief in the resurrection of the dead. Where is the true location of Jesus’ tomb? With the passage of time, the exact location of Jesus’ tomb is uncertain; but, most scholars believe that the location is marked by the Church of the Holy Sepulcher. Since 1883, some consider the Garden Tomb or Gordon’s Calvary as the true location of Jesus’ Tomb. The Garden Tomb or Gordon’s Calvary was discovered when British General Charles Gordon visited Jerusalem in 1883; he thought that he found the true location of Golgotha. The ridge was skull like in appearance and close to the location of a garden tomb, discovered earlier in 1867, with a stone groove which could have housed a large stone. However archeological evidence suggests that the Garden Tomb may have been hewn in the time of the Old Testament (some 700 years before the time of Jesus), and the stone groove may have been a water trough for animals. Because Christian Crusaders used this location as a stable, it clearly was not considered a holy site. Even earlier, Byzantine Christians (300-600 A.D.) did not consider it a holy site either. 1. In 30 A.D., before the Church of the Holy Sepulcher was built, the area was outside Jerusalem’s city walls. 2. Several first century tombs have been discovered on site. 3. At the turn of the era, the area was a large burial ground. 4. In about the seventh or eighth century BC, the area was once a large limestone quarry. 5. From the time of Christ, Jerusalem had a continuous Christian community, and despite the construction of the Church of the Holy Sepulcher in 335 A.D., the location of Jesus’ tomb was well known and was at the same location for 300 years. 1. 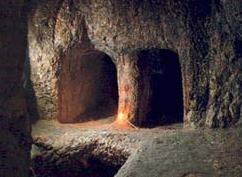 Jesus’ tomb was located within Jerusalem’s city walls. 2. Jewish leaders of the first century did not condone burials west of the city. 3. Hadrian’s Temple to Aphrodite was built over the tomb of Christ to assert Roman rule, prevent another Jewish revolt, and destroy Christian holy places of worship. Because of these factors, it seems apparent that the tomb of Christ was well known and without dispute. While this information is known and passed down by tradition, it has been very difficult to confirm the authenticity of this location for Jesus’ tomb. Over the past two thousand years, there are no fewer than 4 structures that were built over the tomb of Jesus (4th, 11th, 16th 19th centuries) which can be seen in this brief history. Eusebius (263-339 A.D.), a Roman historian and Bishop of Caesarea, records that Jesus’ tomb became a place of veneration until sometime around 130 A.D. when the Roman Emperor Hadrian, as an expression of his distain of Christianity, covered the site and built a large temple to the goddess Venus. Around 325 B.C., Emperor Constantine I ordered that the Roman temple be demolished and the site excavated, and directed his mother, Helena to commemorate the life of Jesus by building churches on significant sites. Consequently the Church of the Nativity was built in Bethlehem to celebrate the birth of Jesus and the Church of the Holy Sepulchre memorialized the crucifixion and tomb of Christ. Eusebius, present at the excavation and construction of the Church of the Holy Sepulchre, records, "contrary to all expectation, the venerable and hollowed monument of our Savior's resurrection was discovered." The tomb of Christ apparently had visible proof attesting to its authenticity; however, Eusebius does not record what the visible proof was. According to tradition, the tomb was isolated and preserved by having its surrounding rock removed so that it was a free standing rock hewn tomb. An aedicule, or small shrine or temple characteristic of Roman funeral architecture, was built enclosing the tomb. The Aedicule had a five column octagonal marble structure over the tomb and a four columned porch over the forecourt. Over the Aedicule was the circular basilica known as the Rotunda or Anastasis (meaning resurrection) completed at the end of the 4th century. Another basilican church known as the Marturion (meaning: testimony) contained Golgotha which was the rock hill that Jesus was crucified on. In 1009, the Muslim ruler, the Caliph al-Hakim, destroyed the Rotunda, most of the Aedicule and the Marturion. Christian pilgrims visiting the site shortly after its destruction indicate that the tomb was not completely destroyed. 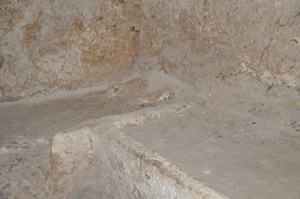 Some of the tomb’s walls and bench upon which Jesus’ body would have been laid was relatively undamaged. Started in 1036 and completed by 1048, the church was rebuilt with a new Aedicule; however, this new church was smaller than the original built by Constantine. When the Crusaders retook Jerusalem in 1099, a larger church was built which took thirty years to complete. This building is largely the current Church of the Holy Selpuchre. In 1555, due to neglect, the Aedicule was renovated by Franciscan friars. In 1808, a large fire caused the Rotunda’s dome to collapse and smashing parts of the Aedicule. Rebuilt within two years, the Rotunda and Aedicule was renovated and restored; however, the dome of the Rotunda was not completely rebuilt until 1868. Because of the destructive nature of archeological digs, it is currently impossible to verify the location of Jesus’ tomb; however, a unique thermal study was allowed by authorities which provided compelling evidence of the tomb’s existence within the Aedicule seen in a video by the PBS series "Secrets of the Dead: The Tomb of Christ" (season 2, episode 5), featuring a scientific team led by Oxford professor Martin Biddle. 2. "The Church of the Holy Sepulcher," from the website Generationword.com. What are the themes of "faith" in the New Testament?